SemiAccurate has been hearing that the rumors that AMD’s (NYSE:AMD) Witchita and Krishna are on the chopping block for a few weeks. Over the last few days, that has been confirmed by several different sources. Yes, you read that right, the follow on to Brazos/Ontario/Zacate has been knifed, there will be no 28nm Wichita and Krishna. Why? No one is saying definitively, but we would guess that it is due to timing of GloFo’s 28nm SHP process. As you can see from the picture below, taken from a GTC 2011 slide, the process is set for production in mid-2012. 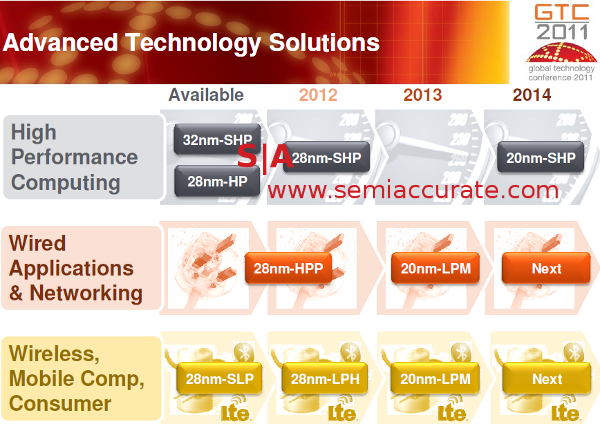 That means there won’t be significant volumes until Q3/2012 for a chip that is due to be replaced at the end of 2012. This means that Wichita and Krishna would have a shelf life of ~6 months, likely less. No OEM is going to pick that part up and design machines around it for such a short time, it isn’t financially viable. Brazos is already set for a mild tweaking to get a little more speed and little less power use, so that will have to hold the fort for an additional six months.